AHHHHHHHH the tiger lotus isn't dead! BABY LEAVES!!!!!! WHOOOHOOO!!!!!! 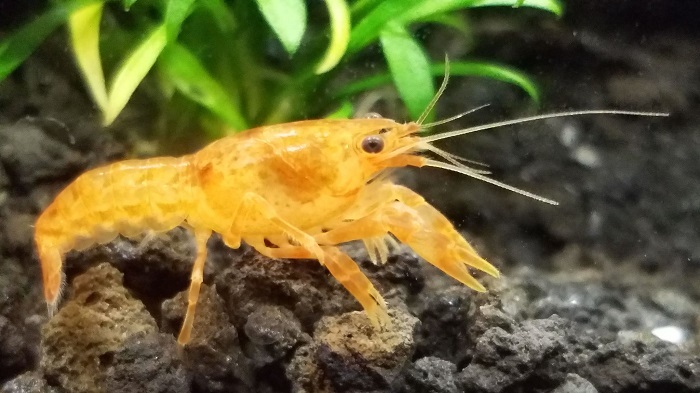 Neo is fat and likes to eat crayfish pellets (and sometimes nibble on algae wafers) otherwise the 5g is doing well, some of the shrimps have disappeared, no surprise there but they continue to reproduce so I still have a pretty static population of about 10-15 most are wild color now, a few blue and oranges tho. 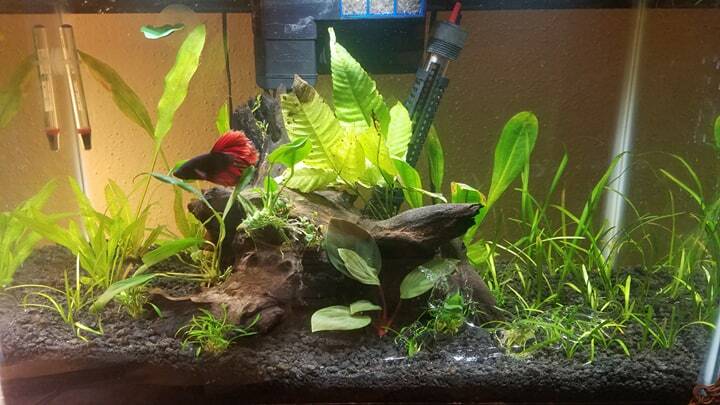 The tank is doing well, no noticeable potassium deficiency since I began dosing about 2 weeks ago. 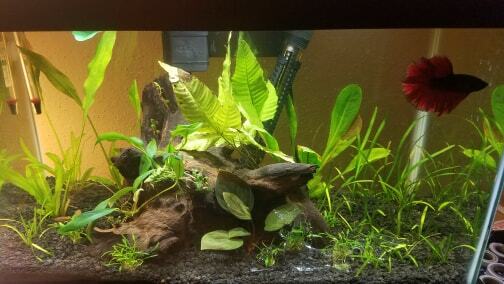 The crypts are doing fantastic, as is the java fern, everything else is just normal lol. 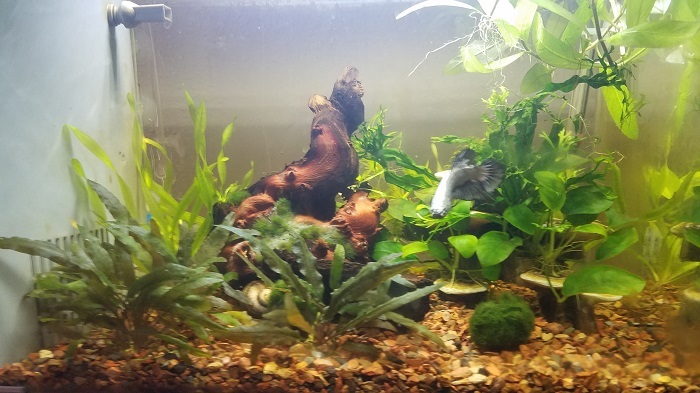 The tank is finally complete in the way of decor, plants are doing well, one of the swords is doing a little better than the others, likely because it's in a more high light area. The tiger lotus is looking good, getting larger every day, tons of little leaves that are showing a lot of red surprisingly enough I hope they stay that way. Been dosing 1/4 doses of Excel daily (.25 mL) so I'm thinking that has something to do with it. 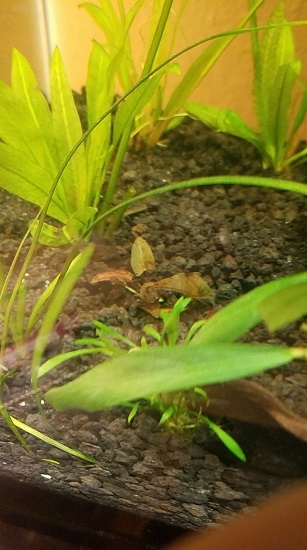 All the pieces of dwarf sag have produced at least 2 new leaves since planting so it's slowly starting to fill in. Very little melt overall, even the crypts are doing well with only a few yellowing/melt leaves. New glass unicorn, the spirit of Mielikki is finally here! For non-D&D people, Mielikki is the goddess of nature and the forest and her common manifestation/icon is the unicorn. Mielikki is also a Finnish pagen goddess of the forest and the hunt. I was wrong, forgot to show off this! Last edited by Shifa; 01-23-2019 at 06:05 PM. Also, I picked up some frozen brine shrimp and have been feeding Neo a couple a day, he REALLY loves them, this is my first time feeding frozen to my betta so I hope they help, he's still going to get a pellet or two so he doesn't go on food strikes later. 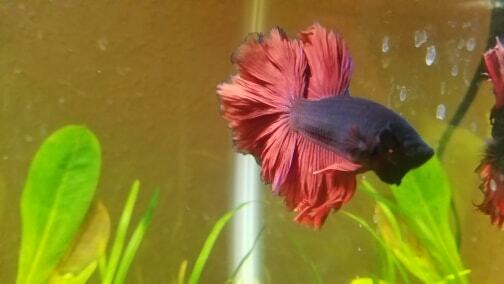 Jafar has a pretty dang spunky personality, he's such a character and completely different from Neo. 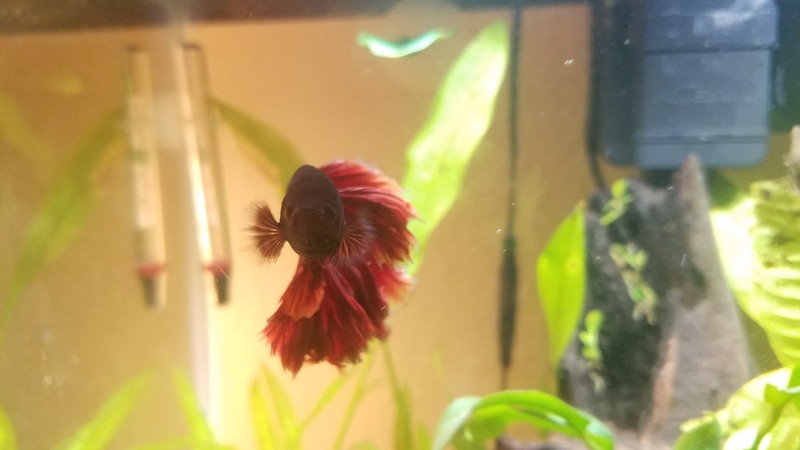 Jafar flares at me, at my finger, at the mirror, at his filter... he LOVES to play in the current caused by the filter and just explore absolutely everything. He built a bubble nest for me yesterday, then when I saw it, he destroyed it. Can i ask about the tiger lotus? Did you buy a bulb, or rooted leaves? I just got one myself, a bulb. 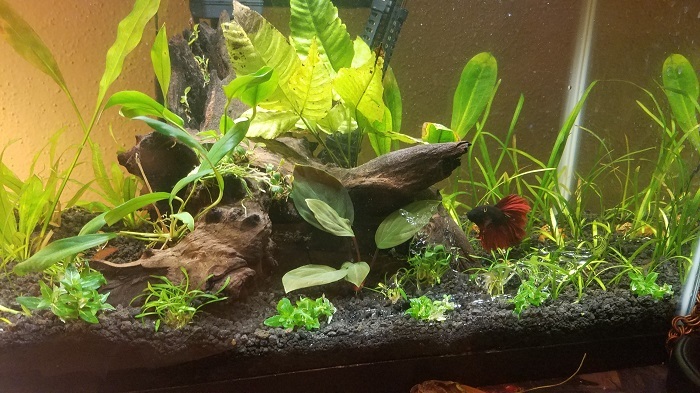 The instuctions said to leave the bulb at least half out of the substrate, so i just dropped it into the tank to lie on top of the gravel for 3 days til my schedules WC and plant tidy - and goodness me! The thing threw out a leaf a day and had rooted 2 inches by the time i got to move it. So did you bury your bulb? Or did you just get a slower growing one than me? Think a slower growing one would be easier maintenance in the long run! Now, a mere 3 to 4 weeks later, mine is sending a new leaf to the surface every 2nd day, and keeping my nitrates lower than I have ever achieved before. The tiger lotus came with two bulbs, no roots, and 4 large-ish leaves which all fell off within 24 hours, 2 weeks later the bulbs are now well rooted (tried to move them... cant...) the tops are kind of exposed, and each bulb has 3-4 leaves they're growing, just slower than I anticipated lol. I have no idea if it's my lighting or ferts or what have you. Maybe it's just a little extra special lol. This is only the 3rd week I think, maybe it took a while to adjust? 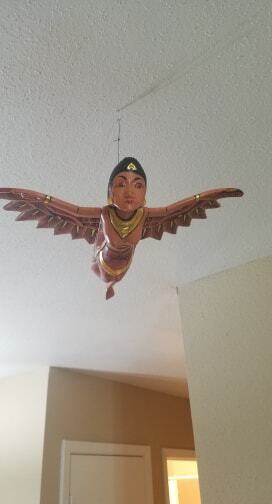 I might try to pull it up a little bit and see if that helps. Last edited by Shifa; 02-03-2019 at 01:55 PM. Ah. That sounds like the size of the bulb makes the difference. Mine was/is about 2/3rds of an inch across. It came from an aquarium plant seller on eBay UK. 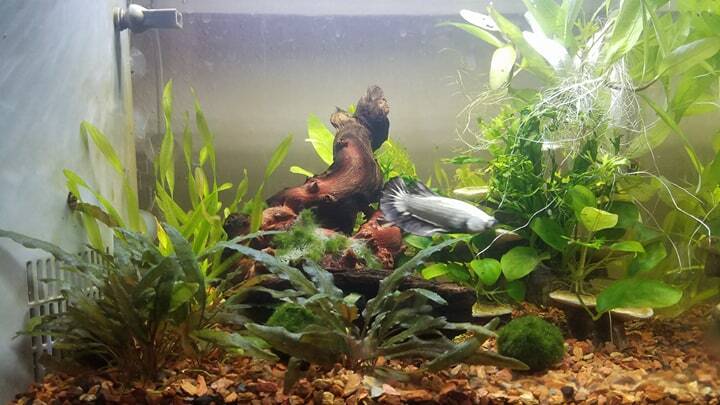 One of the good ones, selling a whole range of quality aquarium plants. I have bought from this seller before and been v pleased. Don’t know if it is OK to post eBay links on here, but I can PM. Though it sounds like your plant is doing nicely, so I doubt you need it. 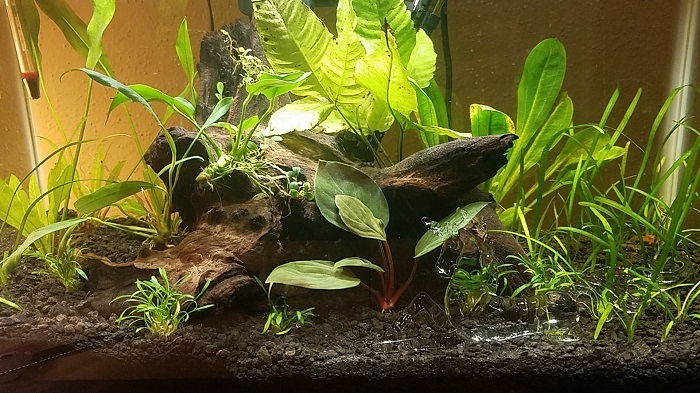 Also bought some Staurogyne Repens to see how it does, here's hoping :D (it's generally a higher light more demanding plant than what I currently have stocked, but figured I'd give it a go anyway. Did my first round of .5mL Excel today to start off the week so multiple things going on lol. Last edited by Shifa; 02-03-2019 at 06:05 PM. 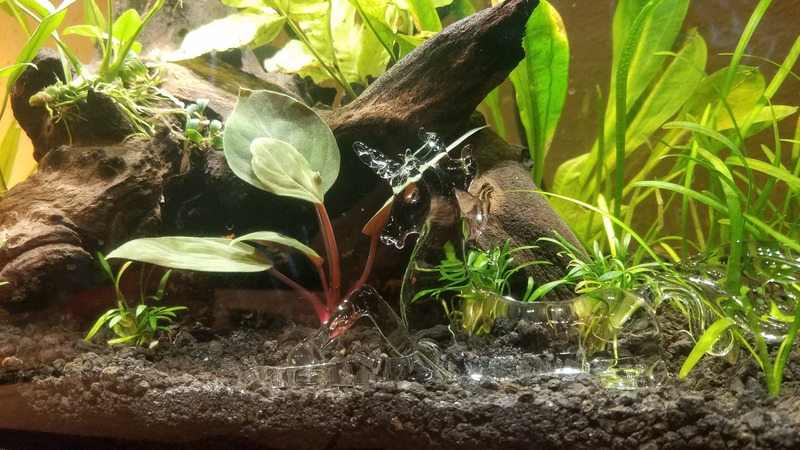 Welp, Jafar ate/killed scuttles :( sad day, I really liked that little crayfish RIP at least now I know I can't house inverts with him... it's funny because Neo gets along just fine with his cray in smaller quarters, but I guess that's just down to personality. So only invert that MIGHT be going into this tank is a nerite... not risking longer antennae of prettier snails to Jafar :( There go my dreams of a Filopaludina Martensi snail... at least until the tank grows in more.